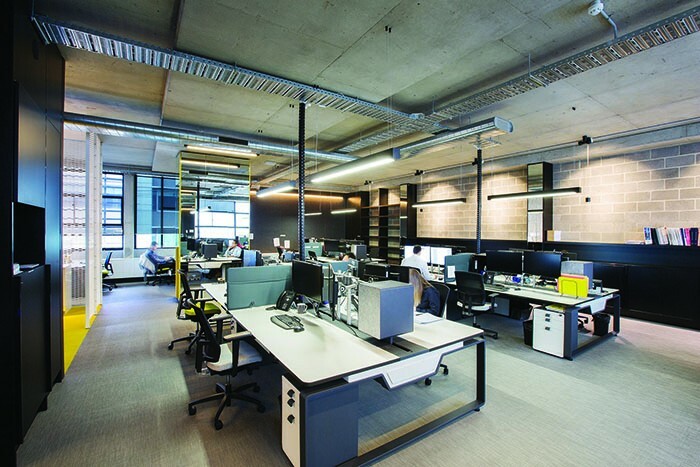 ODC Design provided construction and project management services to complete a new two level fit out for a client located at 35 Market Street in South Melbourne. A modern industrial style was incorporated into the interior design to convey the company’s simple and humble branding. Exposed metal beams and piping, concrete ceiling and wall to wall metal framed windows inspired the use of various types of complementary suspended light fittings, timber panelling and steel metal mesh for creating areas of privacy. Bolon flooring was used throughout the space in addition to upmarket workstations ensuring for employee comfort and productivity. The colour scheme of the interior design involved the use of natural colours with hints of yellow adding for a striking contrast to this elegant workspace.